Uncharted: The Nathan Drake Collection packs all the single-player content of the Uncharted series into one handy box for PS4 owners. Uncharted is the kind of shooting, adventuring and puzzle-solving game that we are used to seeing on each iteration of the PlayStation. It's just that once upon a time we were used to seeing these games starring Lara Croft. 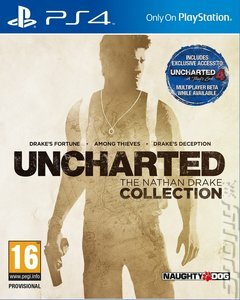 Instead of Ms Croft, the hero of this game is Nathan Drake, and he's in search of a fortune in gold left by his many times great grandfather, Sir Francis Drake. In order to get the gold, Nathan and his helpful assistant, Elena Fisher have to travel through a selection of locations, fighting the criminals who are on their heels every step of the way. Playing as Nathan, you must climb onto ledges, shimmy up vines and ropes, and run around castles, dungeons, cathedrals, labyrinths and other beautifully designed levels, stopping occasionally to solve puzzles. Nathan embarks on a quest to find the lost fleet, and discovers that Marco Polo had been on a mission to find the legendary Himalayan valley of Shambhala - Shangri-La! In Shambhala the Bhuddist's Cintamani Stone - a huge ruby worth billions of dollars, is reputed to reside. With a whole new adventure to explore as Drake searches for the lost city The Iram of The Pillars, whole new elements were brought into Uncharted 3 to make it more involving than ever. An expanded combat system was introduced while the stealth mechanics were simplified and improved. Treasures can be collected throughout which can then be sold for in-game currency that will allow players to upgrade weapons and unlock costumes. This PS4 version also includes new trophies, a photo mode and access to the Uncharted 4: A Thiefs End Multiplayer Beta!